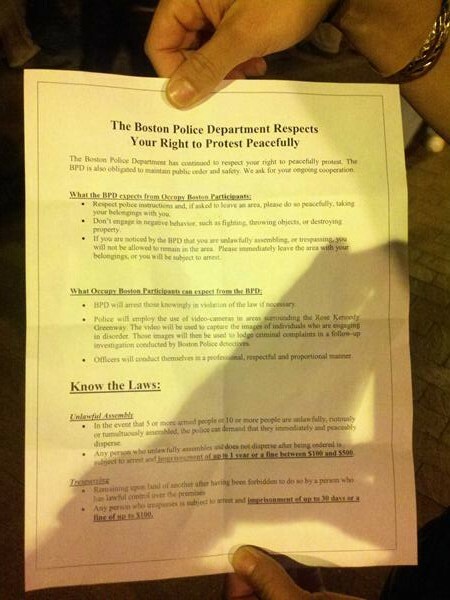 The following is the full text version of a notice first tweeted, then physically handed out to protesters at the Occupy Boston Rally reminding them that the Boston Police Department “Respects Your Right to Peacefully Protest.” The note should be juxtaposed against the events which later transpired, including a large number of arrests well documented in photos and video. 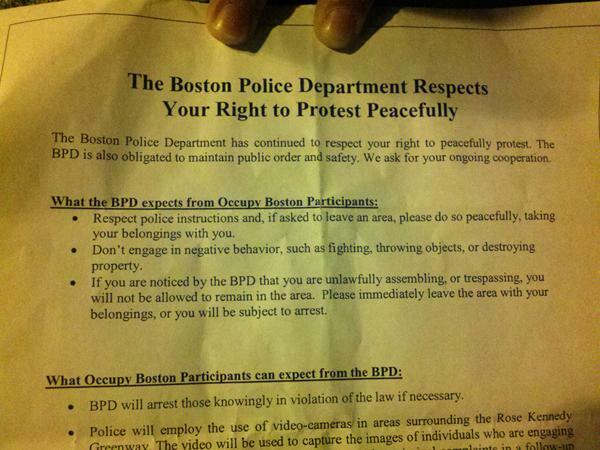 The Boston Police Department has continued to respect your right to peacefully protest. The BPD is also obligated to maintain public order and safety. We ask for your ongoing cooperation. Respect police instructions and, if asked to leave an area, please do so peacefully, taking your belongings with you. Don’t engage in negative behavior, such as fighting, throwing objects, or destroying property. If you are noticed by the BPD that you are unlawfully assembling, or trespassing, you will not be allowed to remain in the area. Please immediately leave the area with your belongings, or you will be subject to arrest. 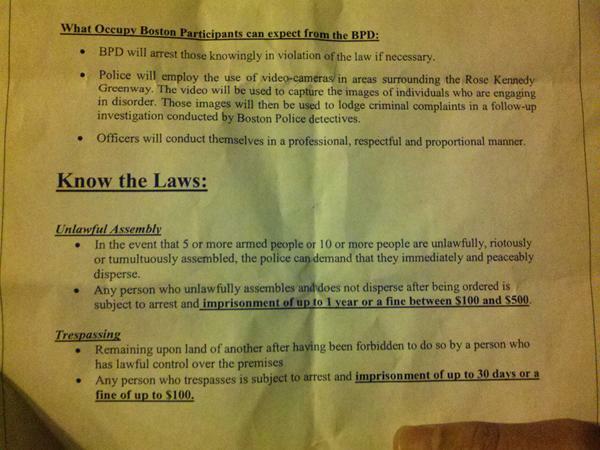 BPD will arrest those knowingly in violation of the law if necessary. Police will employ the use of video-cameras in areas surrounding the Rose Kennedy Greenway. The video will be used to capture the images of individuals who are engaging in disorder. Those images will then be used to lodge criminal complaints in a follow-up investigation conducted by Boston Police detectives. Officers will conduct themselves in a professional, respectful and proportional manner. In the event that 5 or more armed people or 10 or more people are unlawfully, riotously or tumultuously assembled, the police can demand that they immediately and peaceably disperse. Any person who unlawfully assembles and does not disperse after being ordered is subject to arrest and imprisonment of up to 1 year or a fine between $100 and $500. Remaining upon land of another after having been forbidden to do so by a person who has lawful control over the premises. Any person who trespasses is subject to arrest and imprisonment of up to 30 days or a fine of up to $100.